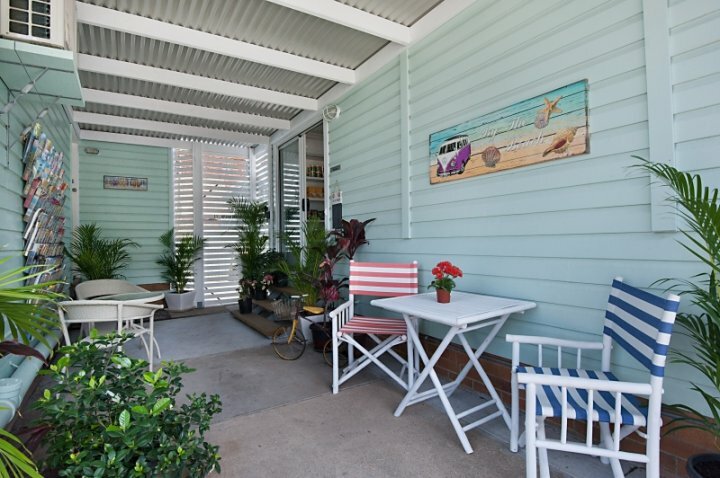 Situated opposite the Gold Coast Airport and 50m from beautiful Bilinga beach, La Costa Motel with their 'beach shack' vibe offers a perfect location for overnight and weekend getaways. The shuttle bus can transport guests free to John Flynn Hospital and Southern Cross University.Check out the many festivals along the Southern Gold Coast and Northern NSW. 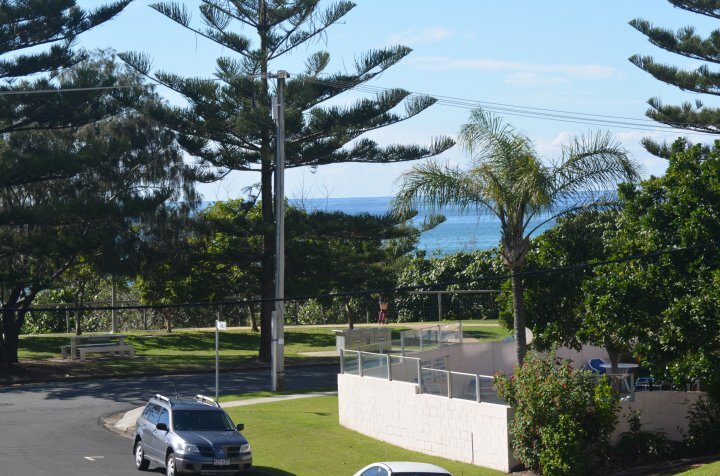 Cooly Rocks On, Quicksilver Pro, Swell Festival - just to name a few. Fresh food and Art Markets run every weekend all along the Gold Coast. 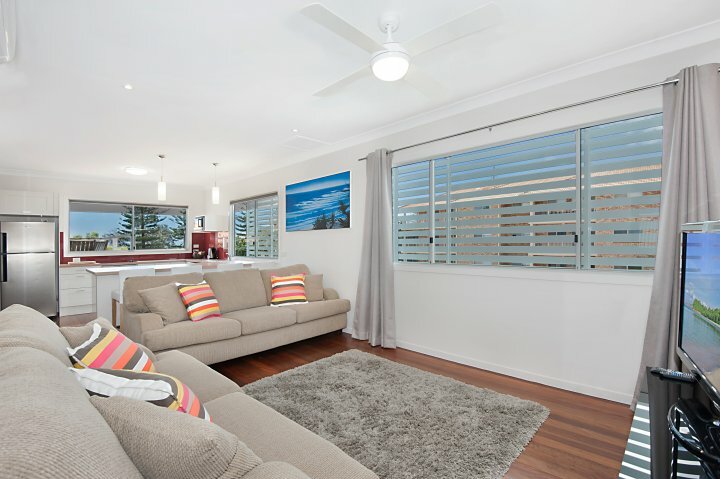 Rooms can be booked with kitchenettes or fully equipped kitchens. All rooms are have a Mini Bar including beers, wines and snacks. La Costa can help with car hire, parking and daily bus tickets. Theme Park Tickets are available for Movieworld, Dreamworld, and Currumbin Wildlife Sanctuary. 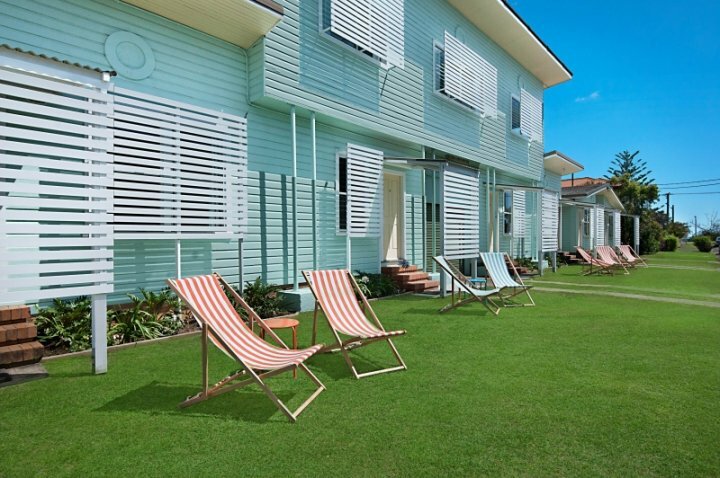 Relax on our beautiful beach recharge your batteries. Our One Bedroom Apartment upstairs is our newest renovated apartment. Looking over the Pacific Ocean from your private deck, you can enjoy the privacy with your family and friends. The Apartment includes a pillow topped comfort guaranteed Queen Bed with equally comfortable Single Bunk Beds sleeping four people in comfort. 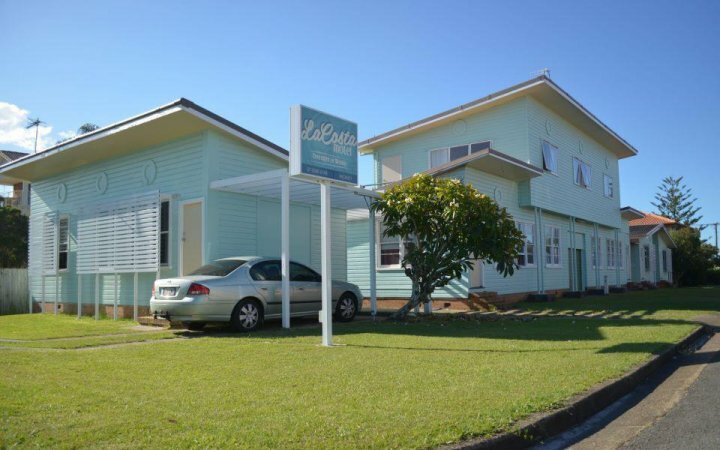 Full kitchen including full size fridge, oven with cooktop, microwave, breakfast bar, lounge, alarm clock, 2 xTVs/DVD players with free DVDs at reception. Added bonuses include FREE WIFI, toiletries, tea & coffee with fresh milk. Snacks and drinks are available for late night treats. Add the Standard Studio upstairs and it turns into a top floor interconnecting 2 Bedroom Apartment. Our One Bedroom Apartment upstairs looks over the Pacific Ocean. 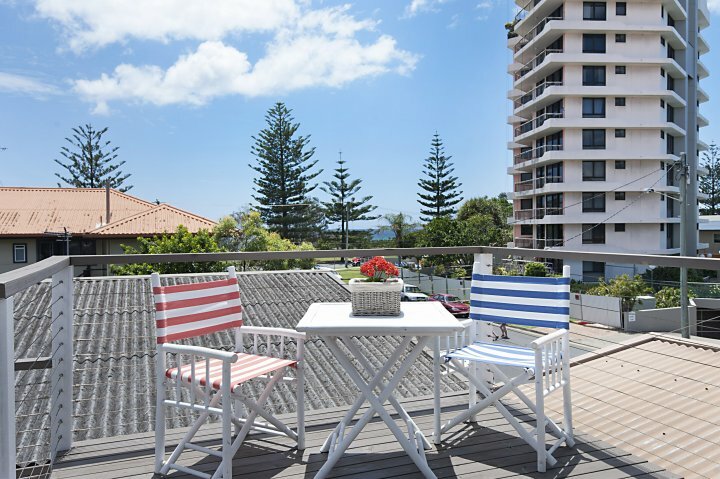 From your private deck, you can enjoy the privacy with your family and friends. The Apartment includes a pillow topped comfort guaranteed Queen Bed with equally comfortable Single Bunk Beds sleeping four people. Full kitchen including full size fridge, oven with cooktop, microwave, breakfast bar, lounge, alarm clock, 2 xTVs/DVD players with free DVDs at reception. Added bonuses include FREE WIFI, toiletries, tea & Nespresso coffee machine with fresh milk. Licensed mini bar and free use of our vintage bicycles are an added bonus. Add the Standard Studio upstairs and it turns into a top floor interconnecting 2 Bedroom Apartment. Our Deluxe Studio includes 1 x Queen Bed and 1 x King Single Bed - all pillow topped with comfort guaranteed. Sleeps 3 comfortably but can always add an extra foldaway bed if needed to sleep 4. They are equipped with a fridge, microwave, tea and coffee making facilities with fresh milk, cutlery and crockery. All Deluxe Studios have a hot shower with free toiletries. 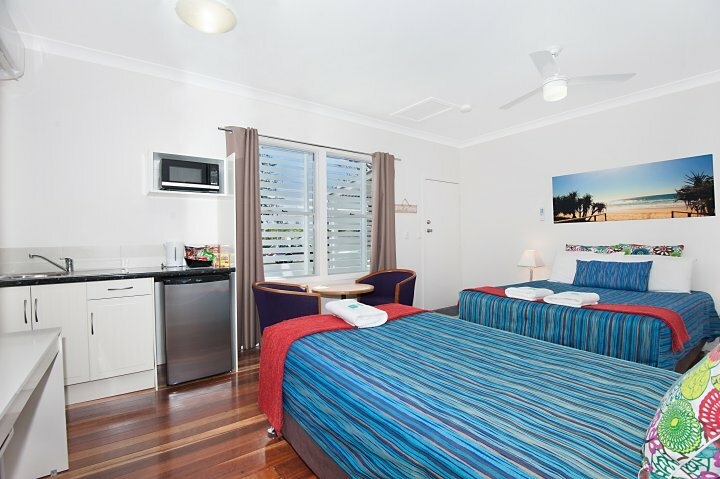 Add iron, ironing board, alarm clock, FREE WIFI and FREE airport shuttles and your night is complete. Our Deluxe Studio includes 1 x Queen Bed and 1 x King Single Bed - all pillow topped with comfort guaranteed. Sleeps 3 comfortably but can always add an extra foldaway bed if needed to sleep 4. 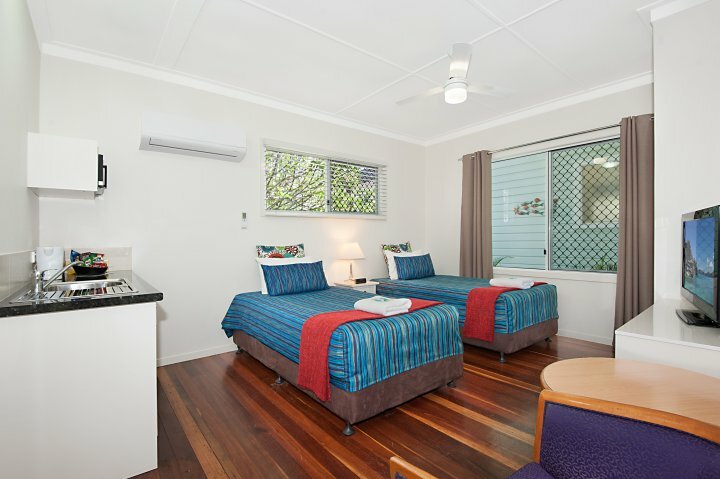 They are equipped with a fridge, microwave, tea and Nespresso coffee machine with fresh milk, cutlery and crockery. All Deluxe Studios have a hot shower with free toiletries. 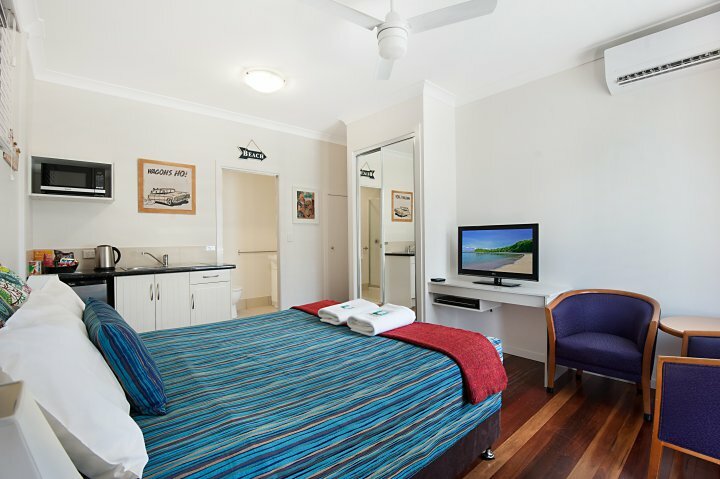 Add iron, ironing board, alarm clock, licensed mini bar, FREE WIFI and FREE airport shuttles and your night is complete. 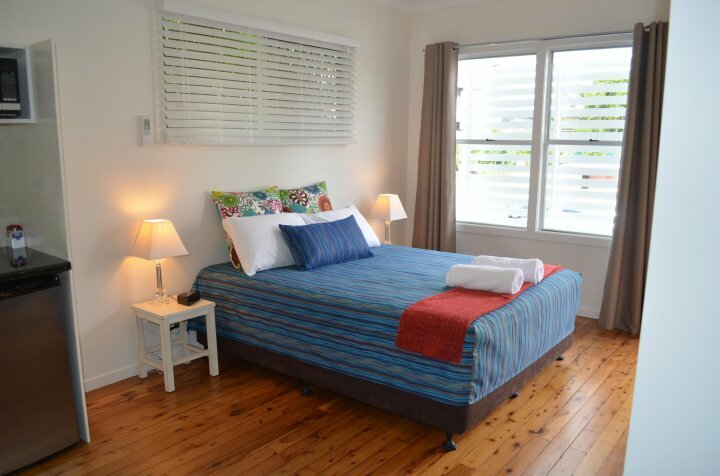 MIN 2 NIGHT STAY.Our Standard Studios include a pillow-topped, comfort guaranteed Queen Size Bed and a hot shower. A 42" TV/DVD player with free DVDs at Reception. All are equipped with a fridge, microwave, toaster, cutlery and crockery. Alarm clocks are in your room for the early risers. Added bonuses include free toiletries, iron with ironing board, tea and coffee with fresh milk, free wifi and free airport shuttles. Snacks and drinks are a delight for those late night treats. Our Standard Studios include a pillow-topped, comfort guaranteed Queen Size Bed and a hot shower. A 42" TV/DVD player with free DVDs at Reception. All are equipped with a fridge, microwave, toaster, cutlery and crockery. Alarm clocks are in your room for the early risers. Added bonuses include free toiletries, iron with ironing board, tea and coffee with fresh milk, free wifi and free airport shuttles. Snacks and drinks are a delight for those late night treats. Our Standard Studios include a pillow-topped, comfort guaranteed Queen Size Bed and a hot shower. A 42" TV/DVD player with free DVDs at Reception. All are equipped with a fridge, microwave, toaster, cutlery and crockery. Alarm clocks are in your room for the early risers. Added bonuses include free toiletries, iron with ironing board, tea, Espresso coffee machine with fresh milk, free wifi and free airport shuttles. A licensed mini bar and vintage bicycles are an added bonus. Stay and Fly includes FREE Airport Shuttle, FREE Continental Breakfast and FREE WiFi. You have read us on TRIPADVISOR so see it for yourself. Minimum 2 night stay. Our One Bedroom Apartment upstairs is our newest renovated apartment. Looking over the Pacific Ocean from your private deck, you can enjoy the privacy with your family and friends. The Apartment includes a pillow topped comfort guaranteed Queen Bed with equally comfortable Single Bunk Beds sleeping four people in comfort. Full kitchen including full size fridge, oven with cooktop, microwave, breakfast bar, lounge, alarm clock, 2 xTVs/DVD players with free DVDs at reception. Added bonuses include FREE WIFI, toiletries, tea & coffee with fresh milk. Snacks and drinks are available for late night treats. Add the Standard Studio upstairs and it turns into a top floor interconnecting 2 Bedroom Apartment. 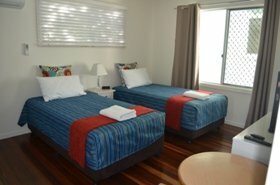 Our Twin Studios include two pillow-topped, comfort guaranteed King Single Beds and a hot shower. A 42" TV/DVD player with free DVDs at Reception. All are equipped with a fridge, microwave, toaster, cutlery and crockery. Alarm clocks are in your room for the early risers. Added bonuses include free toiletries, iron with ironing board, tea and coffee with fresh milk, free wifi and free airport shuttles. Snacks and drinks are a delight for those late night treats. 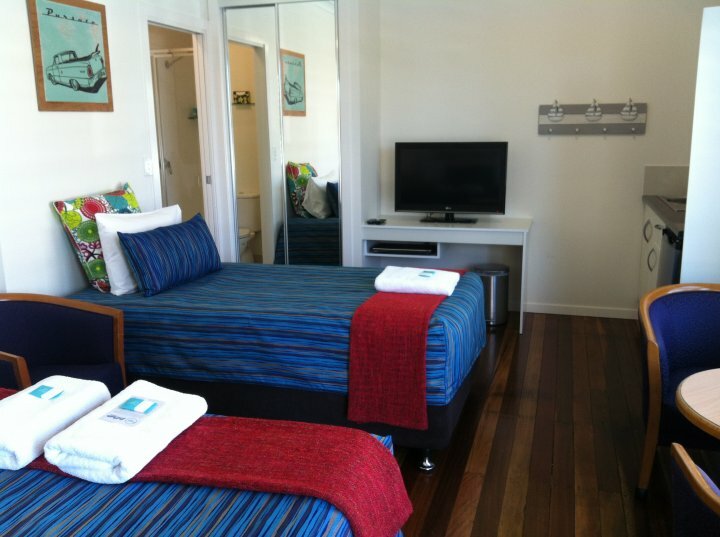 Our Twin Studios include two pillow-topped, comfort guaranteed King Single Beds and a hot shower. A 42" TV/DVD player with free DVDs at Reception. All are equipped with a fridge, microwave, toaster, cutlery and crockery. Alarm clocks are in your room for the early risers. Added bonuses include free toiletries, iron with ironing board, tea and Nespresso coffee machine with fresh milk, free wifi, free use of our vintage bicycles and free airport shuttles. A licensed mini bar is in every room. Our Standard Studio - upstairs includes a pillow-topped, comfort guaranteed Queen Size Bed and a hot shower. A 42" TV/DVD player with free DVDs at Reception. All are equipped with a fridge, microwave, toaster, cutlery and crockery. Alarm clocks are in your room for the early risers. Added bonuses include free toiletries, iron with ironing board, tea and Nespresso coffee machine with fresh milk, free wifi, free use of our vintage bicycles and free airport shuttles. A licensed mini bar is in every room. 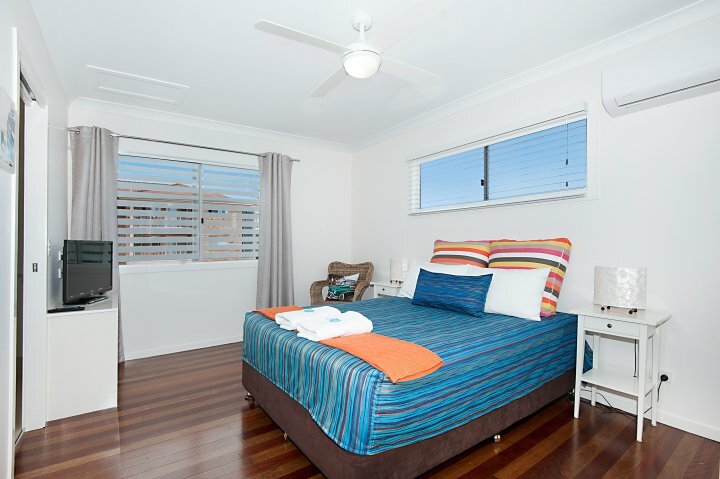 This is an interconnecting room with the One Bedroom Apartment that can be made available for 6 guests. Reception will always print airline boarding passes for our guests. Reception hours are from 8.00am - 5.00pm daily. Free airport Shuttles run Monday - Friday 4.30am - 10.00pm and Saturday - Sunday 8.00am - 5.00pm. All airport transfers must be prearranged. Free car parking is available at the motel.